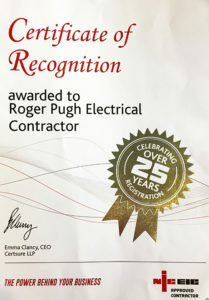 If you are looking for electricians in the Aberystwyth, Aberaeron, Lampeter or Tregaron area, please call upon the services of Roger Pugh Electrical Contractor as your first port of call. We can provide a wide range of electrical services to both domestic and commercial clients, so please get in touch if you need qualified and experienced electricians. We are an English and Welsh speaking business and we have been within the electrical installation industry for well over 25 years. We pride ourselves on offering an outstanding quality of service to our customers, and we are NICEIC Approved for your peace of mind and security. You can be given confidence that your requirements will be dealt with by competent professionals. From full electrical installations to services such as extra socket installations, we can do it all! We consider no job too small to handle, so call Roger Pugh Electrical Contractor today for a no-obligation quote and we will be happy to assist you with whatever your needs are. We have had a great deal of satisfied customers over the years and we are sure that you will be happy if you choose to use us. So make us your number one choice for rewiring in Aberystwyth. Speak to a friendly and helpful member of our team, please call us and we will be happy to discuss your requirements. 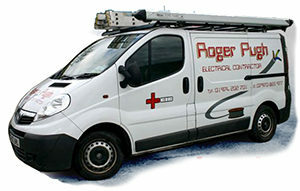 Be sure to make us your number one choice for rewiring, domestic and commercial electrical work.